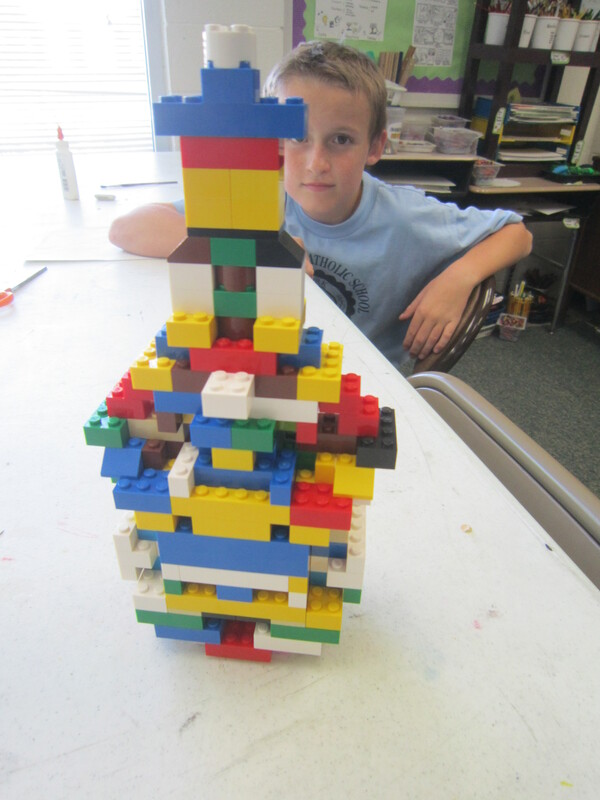 Architecture is our newest center in the art room. 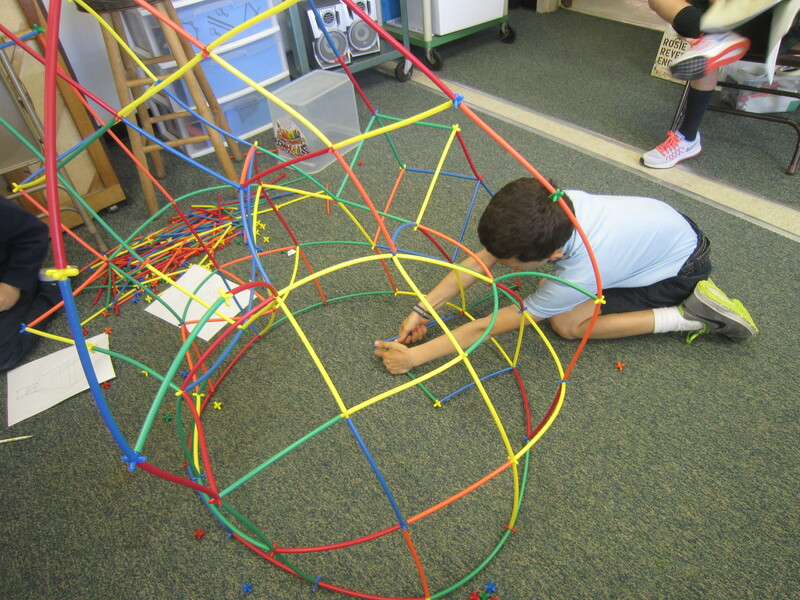 We build structures and then use graph paper to draw our creations. It’s a popular center with all age groups. As students become more adept at authentic art, it is helpful to provide inspiration for their endeavors. In our art room at St. Egbert, I have an inspiration center full of art books and books showing a variety of illustrations. There are also lots of pictures of objects and famous art works. I am currently working on gathering models for drawing. I just purchased some animals and we have a variety of shells plus several items donated from our librarian, Nancy. The 5th graders are currently using Nutcrackers that I have gathered from thrift shops. 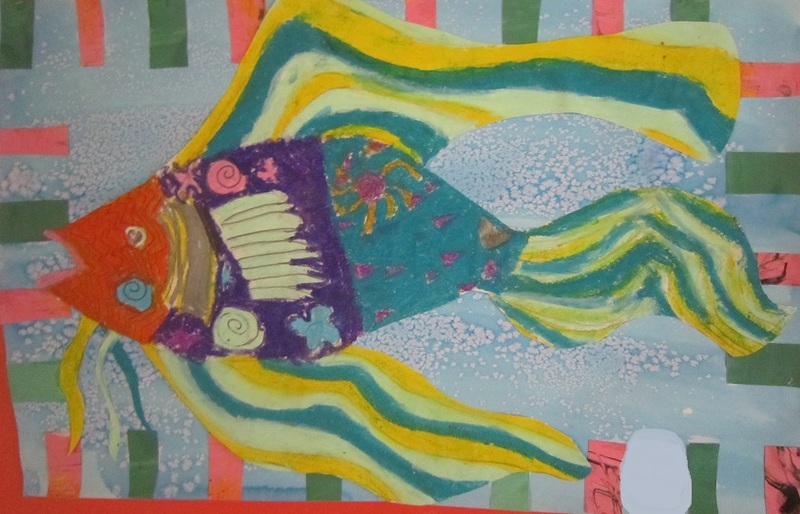 The art room can still use more models, especially sea creatures, animals and still life items, if you have any around your house that you would like to donate. Thank you. 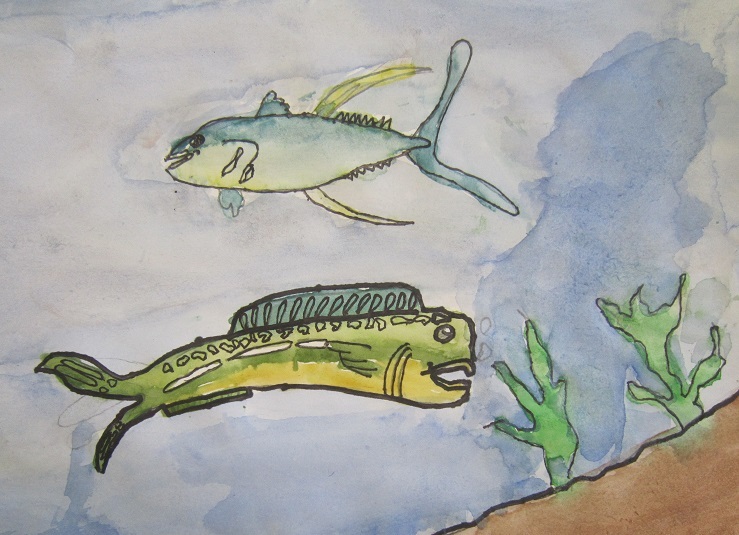 Our artists of the week from 4th grade are Grant and his underwater fish in watercolor, and Erika, and her Matisse inspired picture of a person. Enjoy! In a quote from ‘The Art of Education’, Authentic art is work created and planned by the student to express ideas that are personal and meaningful. It’s what all the historically important artists we admire did and what visionary contemporary artists continue to do today. Authentic art is about meaning and creative thinking; exercises are about replication or building skills. One isn’t better than the other, they are just different aspects of learning and understanding visual arts content. Exercises are important for developing aptitude with media and technique while authentic art experiences are essential for teaching creative thinking. 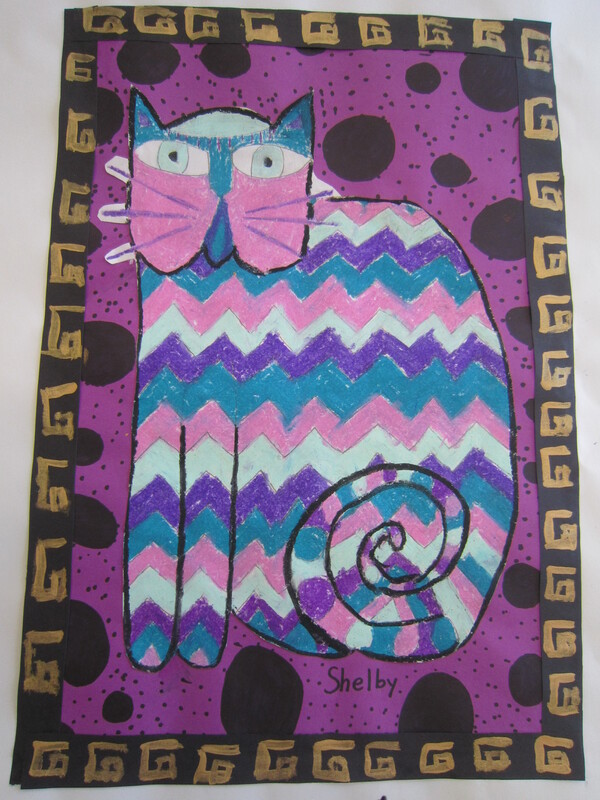 Creating authentic art also provides opportunities to apply skills learned in exercises. We can draw a comparison to the act of learning vocabulary versus writing an essay. 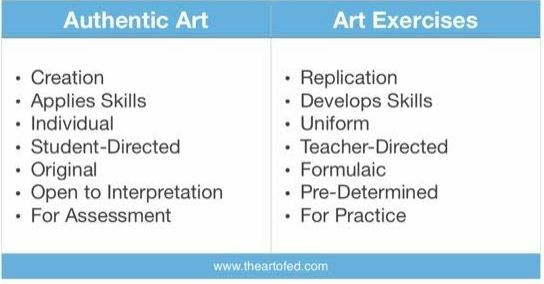 Students need both types of activities to fully learn about making art. I am using both types of art learning in class this year. Most of time students are making authentic art, but every few weeks I present an exercise for them to learn. I also do a 5 minute mini lesson every week to enhance what we are learning. Students seem to genuinely be enjoying their increased choice this year and I’m happy to say are producing some quality work. This year we are using Montessori style art trays in PreK and Kindergarten. I have 20 some trays in the room, each with an art activity for a child to do. 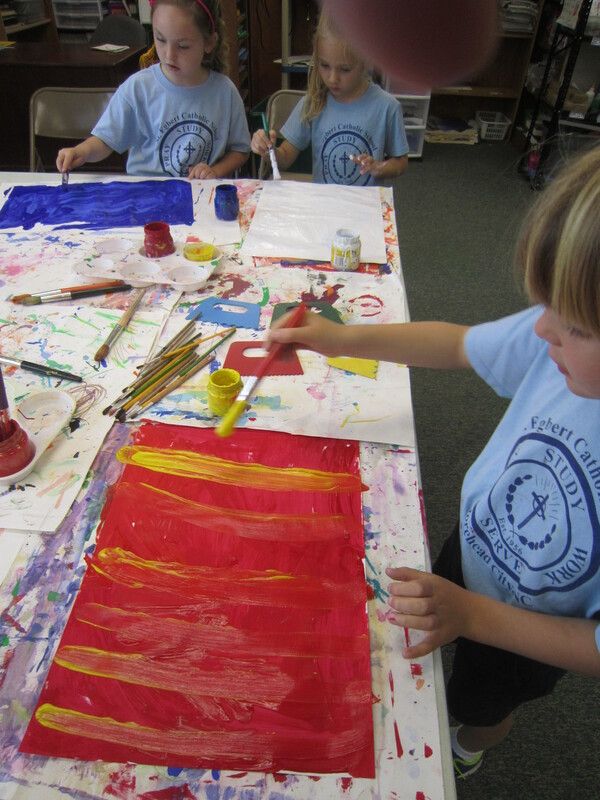 Children may choose from painting, constructing, drawing, printing, fiber and collage activities. Trays change with seasonal, holiday and special event-related items. Every month or so I also have a center that children can choose that represents a skill or exercise we can learn, or a special activity. Last month Kindergarten had an art history lesson where we painted in the style of Georgia O’Keeffe. In October, children make colorful, blended watercolor leaves or they can print leaves with paint. 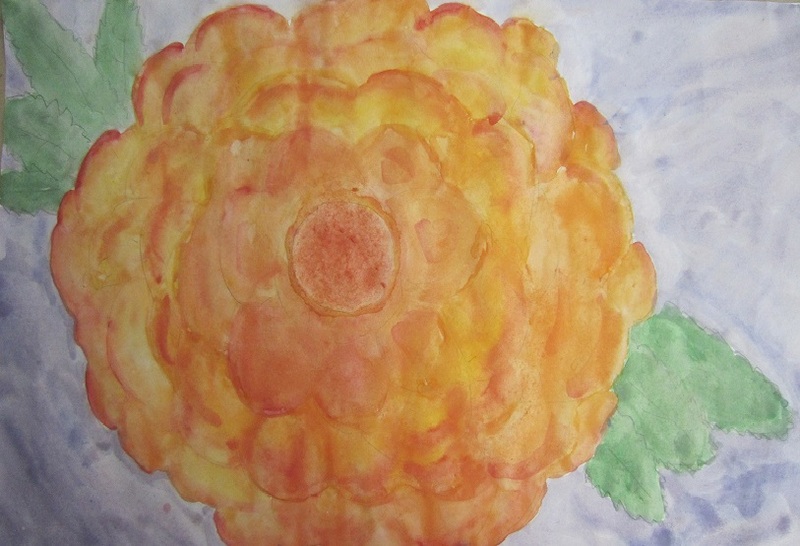 Welcome to a new year in the art room and our own special place on the website. This is where I’ll post ‘Artist of the Week’ pictures, pictures of us at work in the classroom, updates on skills we are learning, and art related news. Speaking of news, we have big changes in the way we do art at St. Egberts. We are now a choice-based art room, meaning children will be making their own choices about how and what they create in class. This method is based on the TAB philosophy of teaching for artistic behavior. We have centers in the room where children pick up their needed supplies, including an inspiration center where they can get ideas. Currently, the drawing, collage and painting centers are open, with more to open as the year progresses. I’ll elaborate more in future posts. 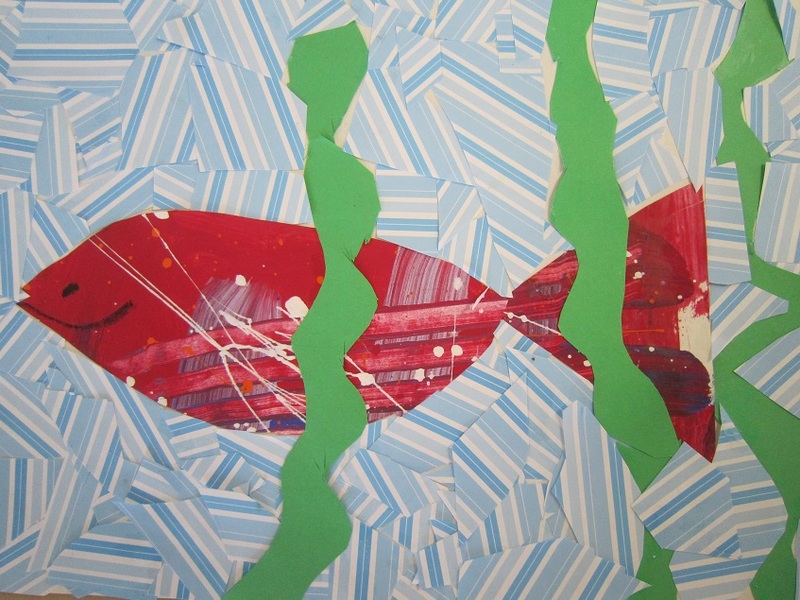 Our first two artists of the week are Luke, from 1st grade and his original collage of a fish and seaweed in the water, and Ingrid, from 5th grade and her interpretation of a Georgia O’Keeffe flower, using blending of tempera paint. Enjoy! Welcome to St. Egbert Catholic School Art Class. I look forward to posting student work for your viewing pleasure! Stay tuned for pictures of our art!